It's BACK and Now with Coil-Splitting and Epiphone ProBucker™ Pickups! The classic Epiphone Genesis was one of Epiphone's most original and modern designs when it was first published in the Epiphone catalog in late 1979. It was intended as a new beginning for Epiphone--a truly original solid body design that could hold its ground with a Les Paul, giving players the added advantage of an eye-catching double cutaway. Now, the Epiphone Ltd. Edition Genesis Deluxe PRO brings back this collector's favorite in all its original glory with added features like coil-splitting, Epiphone ProBucker™ pickups and Grover™ tuners along with a beautiful AAA flame maple veneer top and solid mahogany body in four new beautiful color finishes, including Black Cherry, Midnight Ebony, Midnight Sapphire, and Vintage Sunburst. Early Genesis ads proclaimed "this isn't a guitar for shy people" and "we've created a monster," and you can see why. Along with its bold shape and beautiful finish, the Genesis featured coil-splitting for both pickups via a separate toggle switch. 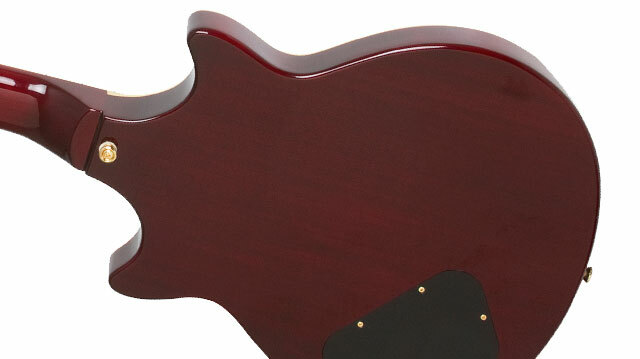 Coil-splitting was a new concept to guitar players and the original Genesis was a bold instrument with a warm sound that could do anything from hard rock to fusion jazz with its incredible sustain from the Mahogany body. In many ways, the Genesis was part of Epiphone's longstanding tradition of giving players more for their money at a level of quality and consistency other guitar makers can't maintain. Today, Epiphone is still a leader in giving players a custom shop experience. And now, the Epiphone Ltd. Edition Genesis Deluxe PRO goes a step further with Epiphone's bold ProBucker™ pickups with individual coil-splitting for the rhythm and lead pickups to put the Genesis back to its rightful place among Epiphone's greatest instruments. Like every Epiphone, the Ltd. 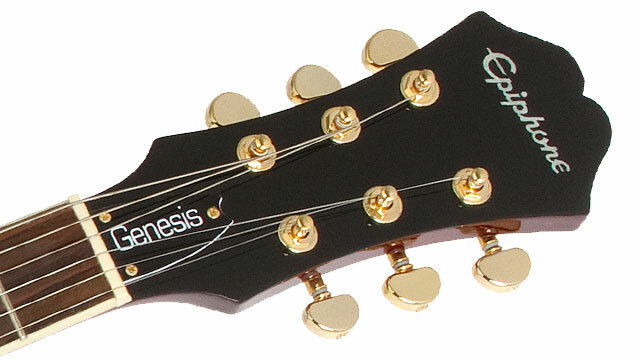 Edition Genesis Deluxe PRO features a Limited Lifetime Warranty backed by world famous 24/7/365 Gibson Customer Service. Step into the future today with the Ltd. Edition Genesis Deluxe PRO. The Epiphone Ltd. Edition Genesis Deluxe PRO features a solid mahogany body with a AAA quilt maple veneer top that delivers the classic tone and sustain that made the Genesis stand out in a crowd. The double cutaway body features 1-ply cream binding on the top for a beautiful vintage look. The mahogany neck has a 24.75" scale with a 12" radius and features a 1960s SlimTaper™ "D" profile--a player's favorite--along with a glued-in neck joint for lifelong stability. The rosewood fingerboard comes with pearloid trapezoid inlays, 22 medium-jumbo frets and a 1.68" nut along with single ply cream binding along the fingerboard. The original Genesis model featured coil-splitting via a small mini toggle. However, the original Genesis did not allow for coil-splitting each individual pickup. Now, the new Epiphone Ltd. Edition Genesis Deluxe PRO zooms into the 21st century with ProBucker™ pickups with coil-splitting on both the rhythm and lead pickups. ProBucker™ pickups feature Alnico II magnets, the same magnets used in sought-after vintage PAF humbuckers. Alnico II magnets provide a rich, warm tone with a sparkling high end and a solid low end. The Ltd. 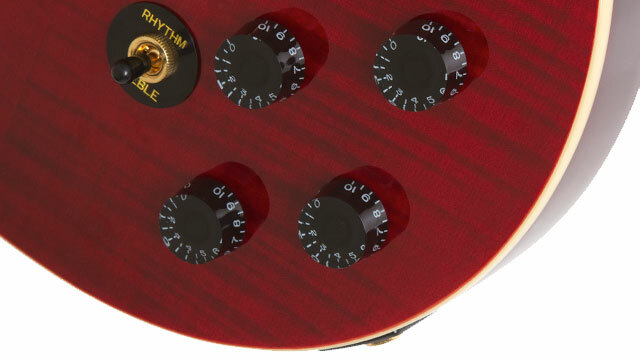 Edition Genesis Deluxe PRO features a ProBucker 2™ in the neck position and a ProBucker 3™ in the bridge position. The ProBucker 3™ is slightly overwound to provide balance with the neck pickup with an added bit of edge for lead work. ProBuckers™ emulate the sound of original PAF pickups which were hand-wound with a few extra turns of wire. Both of the Ltd. Ed. Genesis PRO's pickups feature coil-splitting, which is activated by a push/pull volume speed knob control, allowing players an infinite variety of pickups sounds from single-coil bark to full humbucker bite. When winding humbuckers, Epiphone utilizes a double vacuum waxing process that ensures quiet operation, free from microphonic hum. The pickup is first placed in the specialized wax vacuuming system before the cover is placed on the unit to ensure that the wax fully penetrates to the very center of the pickup and solidifies all parts. After the cover is placed on, it is again given a second vacuum wax bath until the unit is completely saturated with wax. Epiphone uses only the highest quality parts for its pickups, such as ABS plastic bobbins, 1010 Cold Rolled Steel pole shoes and pole screws, Alnico magnets and the finest magnet wire available. The Epiphone Ltd. Edition Genesis Deluxe PRO features Epiphone's legendary rock-solid gold hardware including a LockTone™ Tune-o-matic fully adjustable bridge and a Stopbar tailpiece. And now, Epiphone's updated, patent pending design auto locks the bridge and tailpiece in place with no tools needed! This also results in improved sustain. The Epiphone Ltd. Edition Genesis Deluxe PRO uses 1" diameter potentiometers for better "throw," longer life and reliable service. Epiphone's all-metal toggle switches use rugged spring-steel contacts to ensure years of reliable service and performance. Epiphone's proprietary output jack features an improved contact shape and heavy-duty spring steel to increase reliability and gold Grover™ 18:1 machine heads on a classic '60s era Epiphone Sloped Dovewing headstock to ensure tuning stability and long life. Also available for your Ltd. Ed. 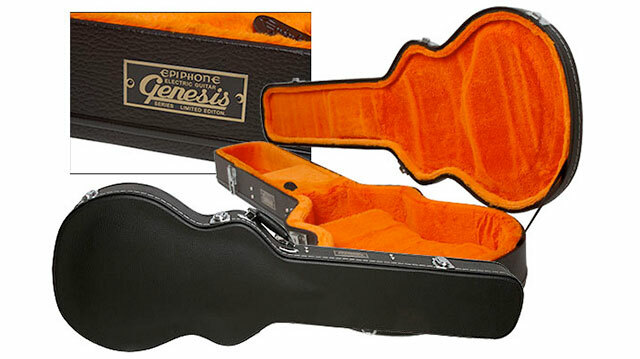 Genesis Deluxe Pro is a reissue vintage-styled deluxe hardshell case featuring the original Epiphone Genesis logo metal badge design on the side and a throwback '70s style plush orange interior for a classic look that's ready to hit the road.